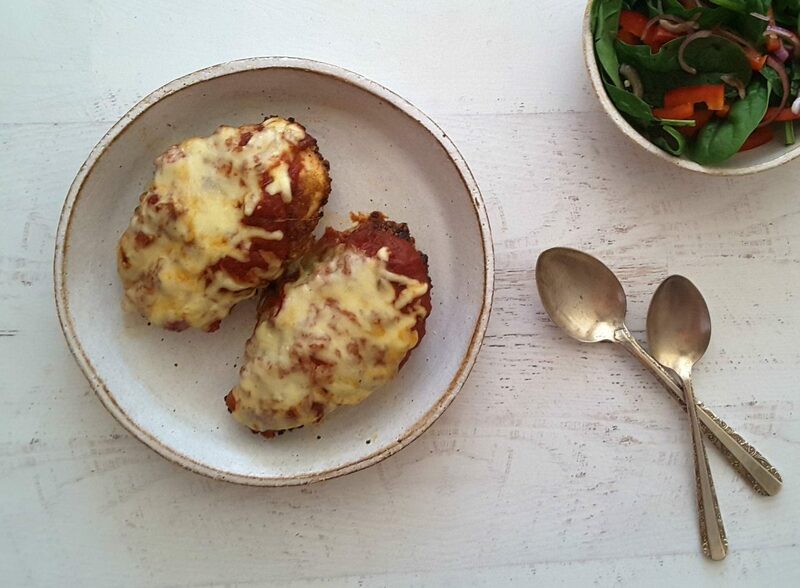 Low Carb Chicken Parmigiana is a simple to make delicious recipe. It was one of those dishes that I occasionally ordered when I was out, and was generally disappointed with when it was actually served. In Australia, it is typical pub food, and generally has been deep fried and topped with some basic tomato sauce and melted mozzarella cheese. Of course I haven’t ordered it for a long time as it is high in carbs. Imagine my excitement when I discovered how simple it was to decarb this recipe. Then I discovered that Low Carb Chicken Parmigiana (Keto Chicken Parmesan) is probably the best parmigiana that I have ever eaten. Now that’s a big call I know, but just wait until you try it. Winner winner chicken dinner….. and it’s a low carb recipe! If you have the time to make your own tomato sauce in this recipe, make sure you try try this home made Sugar Free Tomato Pasta Marinara Sauce. 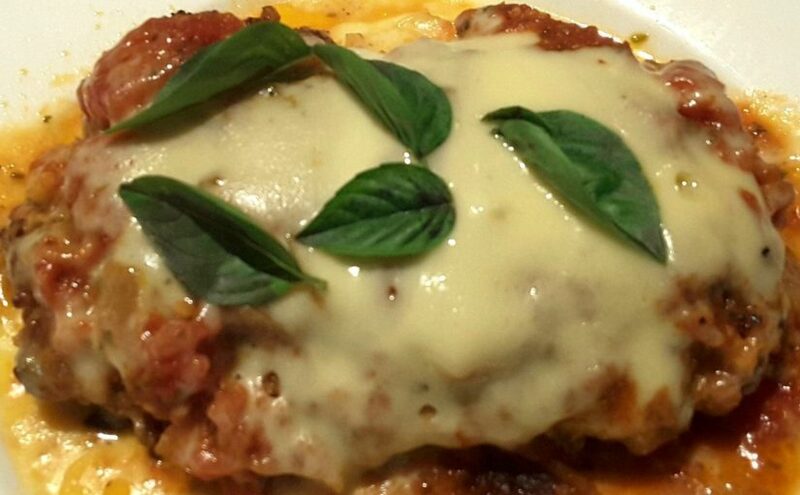 In my opinion, it is the best topping for parmigiana. Feel free to use a store bought Marinara, Passata or pasta sauce for convenience if you need to. If you are worried about carbs and sugars though, be sure to check out the ingredients label, to make sure you select a healthy option. Another reason that I love this recipe so much is the fact that the parmigiana is oven fried. The chicken is initially breaded and oven fried. Simply add the toppings and bake it again for about another 8-10 minutes, and your parmigiana is ready to eat. If you opt to make your own Marinara Sauce from scratch, you will need to cook it on the stove top though. Try serving this delicious dish with a simple salad on the side or your favorite low carb vegetables. Low Carb Parmigiana is a great dish to carb up for any carb lovers you may be catering for as well. Generally served with salad and fries in pubs and restaurants; for a healthier option, serve with sweet potato fries. A really simple way to serve this is on a bed of sauteed spinach. It’s delicious served with buttered zucchini zoodles as well. If you love this recipe and are looking for more recipes with similar flavors, make sure you check out these recipes. This is another recipe that demonstrates how cooking with simple, healthy, real foods, can produce amazing results. Please don’t forget to rate this recipe and share it on social media if you enjoyed it. Preheat your oven to 200 C/ 390 F Fan Forced and prepare an oven tray by lining it with baking paper. 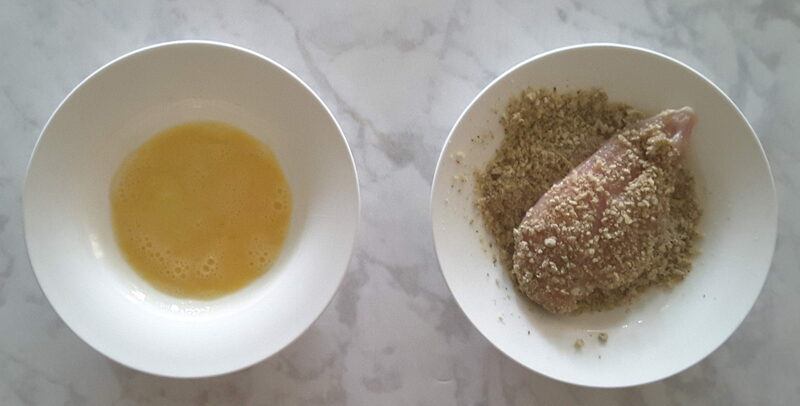 Mix the egg with the mayonnaise in a bowl that will fit the chicken fillet. Blend all of the dry ingredients together for the crumb mixture, and place half of the mixture in a similar sized bowl to the egg mixture bowl, and the other half of the crumb mixture in a cup. If necessary, place your chicken fillets into a plastic bag and using a rolling pin, smash them to flatten them slightly, for a more even thickness. Line your baking tray up next to the dipping bowls. Dip each piece of chicken into the egg mixture. Allow the excess egg mix to drain off and then place the chicken into the dry mixture. Generously sprinkle some of the excess crumb mix that is in the cup, on top of the chicken. Then use your hands to lightly press the mixture into the chicken. Place the chicken onto the baking tray once crumbed. Repeat process with remaining chicken. Bake chicken for approximately 25-35 minutes, or until chicken is cooked through. Turn the chicken over after 20 minutes. Remove the chicken from the oven and top each piece with 3 tablespoons of marinara sauce and 2-3 tablespoons of grated mozzarella cheese. Return to the oven for a further 8-10 minutes or until the topping is hot and the cheese has melted. Serve. Looks amazing. Can’t wait to make it.